(1943) – They used to call him ‘KO Pat’ because he sported a powerful knockout punch. Today, Pat is getting his punch ready for a knockout blow against the Axis. Pat, whose full name is Patsy Francisco, of 11 Newark Avenue, recently went down for the count with a wound in his thigh. However, he is back in top shape and has just rejoined his infantry division for a European Invasion. Pat and his buddies were part of the invasion force that landed at Casablanca on Nov. 8. He was taken prisoner by the Vichy French and later released. Their usual habitat, he stated, was hot, stuffy fox holes into which they made jack knife and swan dives time and again. Pat, for a time was in charge of Italian prisoners, who, he said seemed to be very glad the Americans got there. He was able to use his knowledge of Italian to converse with them. Camaraderie between the Italian and American troops was very prevalent, he said, cigarettes being passed to the prisoners by the men. Food, he wrote, was very hard to get in North Africa, although champagne was plentiful and very cheap. The only food that could be obtained in appreciable amounts, he added, was bread. “And how much of that can a man eat?” He asked. Other sights that impressed him were the North African sunsets an the Atlas mountains. 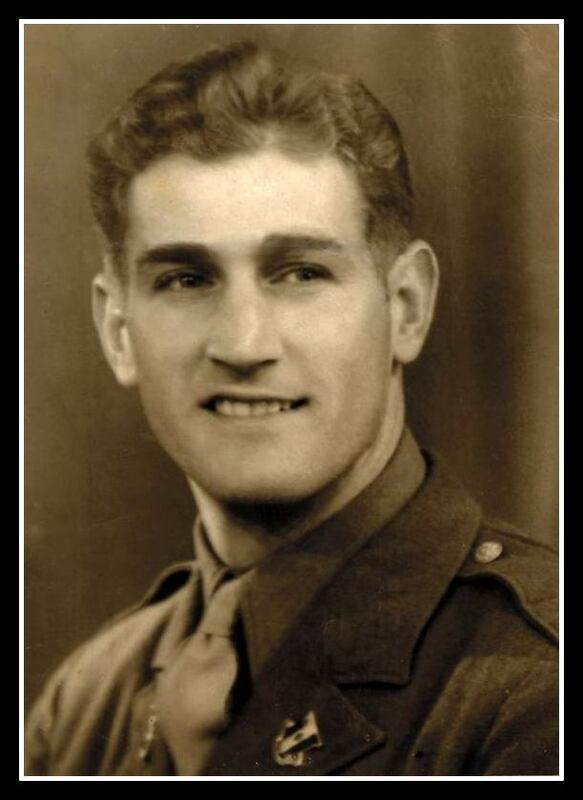 Pat joined the Army two years ago and remained in the United States until October 1942, when he was given a 10-day furlough and then shipped overseas. He acquired entire training in Fort Bragg, N.C., where he spent nearly two years. Pat was born in Nutley and attended all the local schools. He was working at the Lobsitz Mills at the time he was drafted. 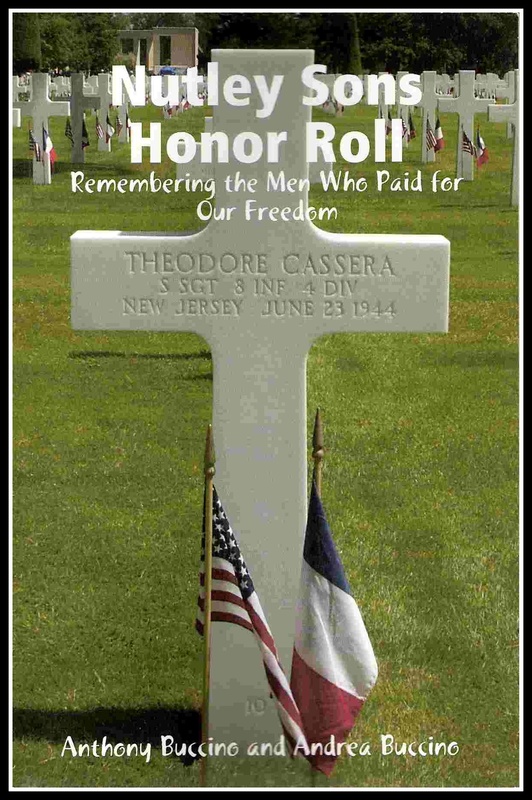 (1944) – Mr. and Mrs. Nicholas Francisco received word recently that their son, Pfc. 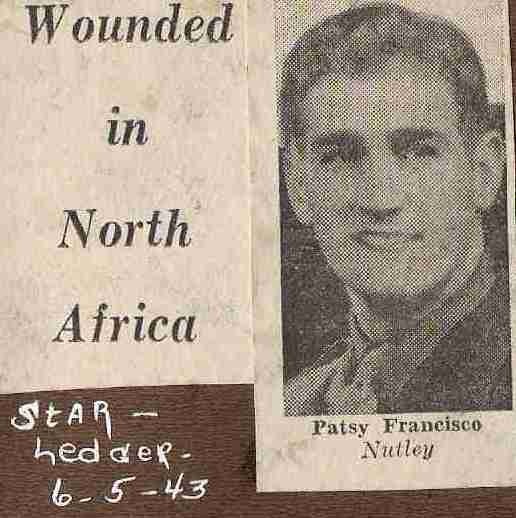 Patsy Francisco, an infantryman who also participated in the Sicilian invasion, was wounded in Normandy on June 14. The group was the spearhead of the attack on the Germans in the vicinity of Sedjenane Valley, Tunisia, on April 23, 1943. It also completed the capture of the northern end of the Cherbourg Peninsula. Pfc. Francisco was taken prisoner of war and released upon the capture of both territories. The wounded man is now convalescing at an English hospital from a leg injury. He also received wounds in the thigh on April 7, 1943, during the African campaign, while administering first aid to a captain of his outfit as a German plane strafed overhead. Mr. and Mrs. Francisco recently received award of the Purple Heart. Pfc. Francisco, 25, entered service on Jan. 10, 1941, and received his basic training at Ft. Bragg, N.C., going overseas in September 1942. Born in Nutley, he attended Nutley High School. He was an employee of Lobsitz Mills prior to entering the armed forces. In addition to his parents, Pfc. Francisco has four brothers: Joseph of 86 Bloomfield Ave., Valentine of 11 Newark Ave., Harry of West New York, and Gerald of Passaic. A sister, Mrs. Madeline Lofrano resides at 60 Union Ave.
An older brother Pasquale De Francesco died during WWI.